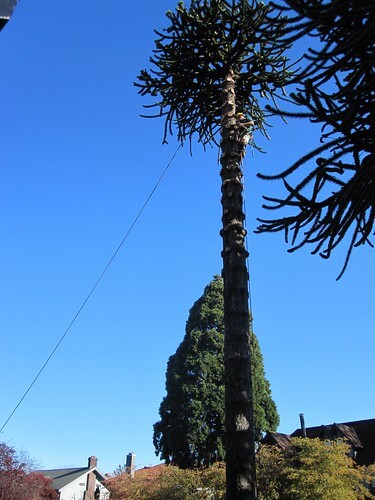 We took the 9:00a ferry in to see the Monkey Puzzle trees being taken down. We got to the house about 10a and Bartlett Tree Service was about half-done limbing the first tree. By about 1pm the first tree was down to a stump and they were starting the other tree. We left at 2:30p and they thought they’d finish it, but by 5pm they hadn’t. It was limbed and topped, but a 40-foot trunk was still standing and needed to schedule a day to finish it. We also met with another electrician and another plumber to bid on the project. And the people from Pacific Galleries came to take some lighting fixtures that we’re going to sell at their auction in November. The foreman for Bartlett Tree Service made a point of thanking us for hiring them. I assume it’s because of the state of the economy, most people are happy to even have a job these days, but you don’t hear it very often even now. He didn’t have to do it, of course — they do their job, we pay them, it’s a fair trade and we’re both satisfied — but it shows good character (and doesn’t take much). I’m more inclined to hire someone in the future who appreciates the work than someone who doesn’t. Some people we’ve hired over the years behave as if they’re owed a job and that we should be thankful that they’re willing to accept our money.